Minestrone, literally “big soup” in Italian, doesn’t have a fixed recipe, but it always contains a few vegetables and some kind of beans. Other common ingredients are pasta or rice added towards the end of the cooking. When I was a kid I really disliked minestrone, but I now really like a few variants, in particular if they contain tomatoes (not a very common ingredient for minestrone) and no rice. Being a quite thick and rich soup you can serve it as a main course on its own or, in smaller quantities, before another main course. Add to a big pot a couple of tablespoons of olive oil, the diced onion and the diced celery. Fry on low heat until translucent but not browned. In the meantime, if you are using the bacon, chop it very finely so that it can almost melt into the soup; you could use an electric chopper if you have one. Add the bacon to the onion and celery, and cook for a few minutes. Clean the cabbage and chop it in big pieces. Add the cabbage, crushed tomatoes, the drained beans, the broth, the spices, the sugar and a couple of big pinches of salt. If you have some Parmigiano cheese, cut a big piece of crust from it and add it to the soup; it will add an amazing flavour. Let the soup simmer 45 minutes, adding water if it gets too thick. Add the washed and chopped kale to the soup and cook for about 10 minutes. Taste and add salt if needed. The soup should be quite thick, but still a soup, so add water if needed. Add the pasta and cook until tender. Remove the crust of Parmigiano from the soup and throw it away (or better, eat it!). Serve in bowls. Drizzle with a bit of olive oil and dust with some grated Parmigiano cheese. Minestrone freezes really well, in particular without the pasta. If you are planning on freezing the minestrone, keep it a bit thicker. When the kale is cooked, remove the pot from the heat and let it cool down. Split the minestrone in portions and freeze it in individual containers. When you want to eat the minestrone, put the thawed soup in a pan with a bit of water and bring to a boil. When it’s boiling, add the pasta and cook until tender. 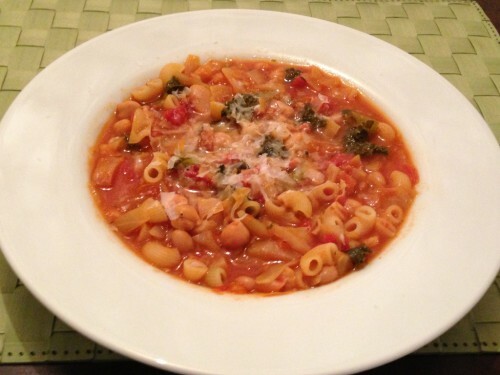 This entry was posted in first courses, soups and tagged bacon, bean, cabbage, kale, minestrone, parmigiano, pasta, tomatoes by Marco Barisione. Bookmark the permalink.